Raw Veggie Wrap With Ginger Tahini Dipping Sauce - Includes Daikon, Avocado, Mango, Red Bell Pepper, Sprouts and More! Try using cabbage (pictured), lettuce or collards as a wrapper. Daikon root makes a tasty and healthful wrap ingredient. Fill a platter with ingredients for your guests to choose. Fill wrapper with an assortment of fruits and vegetables. Add ginger tahini dipping sauce, roll up and eat! Raw Veggie wraps are a staple in a raw food diet. They make a beautiful meal for guests or a convenient meal for the family. Fill them with your favorite veggies and fruits and top them with this delicious, raw tahini-ginger sauce. 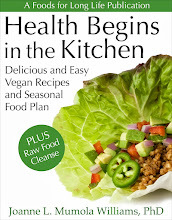 Instead of tortillas or lavash wrappers, raw recipes typically use big leaves of lettuce, collards, cabbage or other greens as a wrapper. I happen to find this very interesting looking cabbage (a cross between Chinese and Napa cabbage) so I thought I'd try it. It was a bit hard to fold so it was more like a soft taco than a wrap but it held its shape very well and was very tender. If you use collards, select the largest leaves and cut out the center stem. Raw daikon is commonly used in Japan to aid in the digestion of carbohydrates, fats and proteins. It's often found grated and served with sushi. Daikon is a cruciferous vegetable, like broccoli, kale and cabbage, and is associated with protecting against cancer. Cut into little circles, daikon makes a great "chip" for guacamole or raw hummus with sprouted garbanzo beans. Arrange all veggies on a platter. To make the sauce, combine all sauce ingredients in a small bowl and mix until smooth. Serve with the veggies. To make a wrap, take a large leaf, arrange all veggies in the center, top with sauce, fold and enjoy! Per wrap: 130.6 calories, 6.8 g fat, 0.9 g saturated fat, 0 mg cholesterol, 3.6 g protein, 16.1 g carbohydrates and 3.9 g of fiber. Just clip it to your belt or pants. Try Wearing a Pedometer - It's a Great Motivator to Get Off the Couch! If you read my January 3, 2010 post, "Get Healthy in 2010 - Three Things You Can Do Now", you may recall that #2 was to "Get Moving". The stats quoted from a recent study were so amazing they are worth repeating. - Decrease depression as effectively as Prozac or behavioral therapy. The hope of avoiding these debilitating diseases should be motivation enough but I now have a new gadget to help motivate me even more! It's a pedometer and it really works! A pedometer is a small electronic gadget that measures how many steps you take each day. I bought the Omron HJ-112 for around $25, but there are many others. See the “top 10 best pedometers”. Here are some of the things it can do: Once you calibrate the length of your step, it records how many steps you take, how many miles you walk each day and how many calories you burn. The Omron even differentiates between regular steps and “aerobic” steps (aerobic steps are those from walking a certain steady pace for over 10 minutes). It also notes how many minutes you walked aerobically. This model also stores 7 days worth of data and the real fancy ones can download your data to a computer for even more analysis. But the most important thing is for you to set a goal each day and for this little guy to tell you if you met it. - Under 5000 steps/day as a "sedentary lifestyle index"
- 5,000-7,499 steps/day might be considered "low active." - 7,500-9,999 might be considered "somewhat active." - 10,000 steps/day should be used to classify individuals as "active". - Individuals taking more than 12,500 steps/day are likely to be classified as "highly active". I wanted to walk around 10,000 steps per day but quickly realized that a goal like that would certainly take quite a bit of effort. I found myself walking to the grocery store instead of driving. One day I walked 40 minutes to the post office to mail a letter instead of leaving it in my mailbox for pick-up. I jumped on my elliptical trainer every night while watching the Olympics instead of sitting on the couch. I went to my Zumba dance class and racked up 6,000 steps in an hour. That little pedometer hooked to my belt truly motivated me. Why? Because I, like most people, like to get feedback. It’s one thing to say, “I’m going to be more active” but it’s another thing to say, “I’m going to walk 10,000 steps a day and easily measure to see if I did it. For the amount of “push” it’s given me this week to get moving, it’s the best $25 I’ve ever spent! In my first week of wearing a pedometer, I averaged 8,500 steps, or 3 miles per day. I also averaged 3,700 aerobic steps or 34 minutes of aerobic activity per day. I didn’t reach my 10,000 step per day goal but I am pretty pleased that I had over 30 minutes per day of aerobic activity. I’m also certain that if I weren’t wearing this pedometer, the numbers would have been much lower. I will keep my goal at 10,000 steps per day and hopefully work myself up to that level soon. I highly recommend this little gadget, especially if you’re trying to increase your activity, lose a little weight and improve your health. Make sure you check with your doctor before you significantly increase your activity. This was one of the first recipes I posted on FoodsForLongLIfe.com. As I was preparing this yesterday for a photo shoot for my cook book, I made some important changes to the recipe. Since it's such a favorite of mine and such a hearty yet low calorie, nutritious meal for these cold winter nights, I thought I would re-post it with the changes. This soup is very filling yet is has less than 200 calories per bowl! It's also low in fat and high in fiber. If you are trying to lose weight, this is a very satisfying dish. Make a big pot on Sunday and enjoy it for lunch or dinner during the week. Heat olive oil and sauté the onion, celery, carrots and rosemary over low to medium heat for 5 minutes, stirring frequently. Add garlic and cook another minute. Add tomatoes, vegetable broth and bay leaf. Bring to a boil then reduce heat, cover and simmer for 10 minutes. Wash the kale well, removing and discarding the center stalk before slicing. 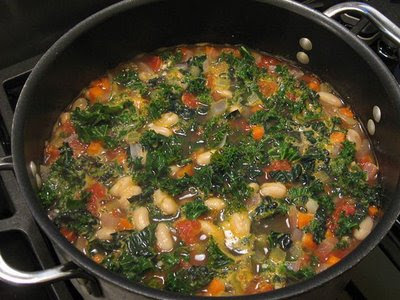 Add sliced kale and 2 cans of beans to the pot, bring back to a low boil and simmer, covered, until kale is tender (about 5 to 10 minutes). Turn off the heat, remove bay leaf, add lemon juice and salt and pepper to taste. Top each bowl of soup with 1/2 tablespoon parmesan cheese if desired. Serve with a nice loaf of crusty, whole grain bread. Per serving: 196.8 calories, 3.8 g fat, 0.8 g saturated fat, 10.3 g protein, 30.8 g carbohydrates and 8.5 g of fiber. Collard greens are a nutrient powerhouse! Remove center stem and cut into 1/2 inch strips. Pimentón is a Spanish smoked paprika. Last week while visiting my daughter, she made collard greens with a spice that was new to me. 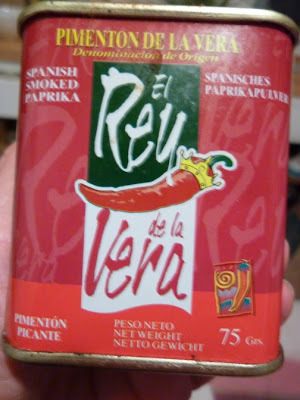 Although I'm no stranger to paprika, I had never cooked with pimentón, a Spanish, "smoked" paprika. Its spicy, smoky flavor went very well with the slowly simmered collards. When I returned home, I ran out and bought this spice and cooked the collards dish once again. I quickly realized that pimentón comes in different levels of "heat" and the one I purchased wasn't very spicy at all. Although both kinds were quite good, the one you buy will definitely affect how much you use in this recipe. The pimentón "picante" is very spicy and would need 1/4 to 1/2 of a teaspoon for a large bunch or two small bunches of collards. If you use "agridulce" or medium hot pimentón, you would use a little more. For the sweet "dulce" version of pimentón, an entire teaspoon of the spice can be used. Just experiment to find the intensity and the flavor that pleases you. I look forward to experimenting further with this delicious spice. Collards weren't popular in my mother's household. We ate lots of chard but never any collards. Probably because of her busy schedule (she worked all day at her job and then came home, fed us dinner and worked in my father's store until closing time). Chard takes minutes to braise and collards take much longer to tenderize. But it's worth the wait. Collard greens are a nutrient powerhouse, much like kale. They are a very good source of vitamin A, C, K, B6, riboflavin, folate, calcium, iron, and manganese. One cup of cooked collards is only 49 calories and provides 5 grams of fiber. They also provide protein, vitamin E, thiamin, niacin, magnesium, phosphorus, potassium and omega 3 fatty acids. Truly one of the most nutrient dense foods around! Soak the collards in a large bowl of water, rinsing them several times to remove any sand. Drain and remove the center stem. Slice into 1/2 inch strips. Set aside. Heat olive oil and sauté onion for 5 minutes. Add garlic and cook another 2 minutes. Mix in the pimentón. Add the sliced collard greens, vinegar, water and salt and mix well. Cover and slowly simmer until soft, about 45 minutes, stirring occasionally. Adjust the seasonings adding more pimentón or salt, as needed. Steam sweet potatoes until soft, about 20 to 30 minutes. Place in a mixing bowl with orange juice, maple syrup and salt and whip them with a hand beater until smooth. Serve the collards over the whipped sweet potatoes. My Garlic Is Sprouting! What Should I do? How To Make Your Own Garlic Powder. Garlic begins to sprout when it gets too cold. Remove the sprout from the garlic clove before slicing. Sliced garlic on a Teflex sheet ready to dehydrate. Dried garlic chips in a VitaMix "dry" container. Sift to separate dried minced garlic from garlic powder. Dried garlic chips, minced garlic and garlic powder. My husband and I went on vacation and to save energy, we shut off the furnace. We live in California so we weren't too worried about our pipes freezing. But what we forgot was that garlic starts to sprout when it gets too cold. We had our 200 heads of garlic that we harvested this spring in the house and we were unpleasantly surprised to find about 1/3 of them sprouting when we got home. I had already planted all the garlic that I needed for next season and it was a bit too late to prepare another bed anyway. What on earth was I going to do with all of this sprouting garlic? What's that old expression? When life hands you lemons, make lemonade. So, when life hands you sprouting garlic, why not make garlic powder? I've always wanted to try making my own garlic powder. It always annoyed me to grow hundreds of heads of garlic and then go buy a jar of garlic powder. But I never wanted to waste a beautiful, fresh head of garlic to do this. Finally, here was my chance! 2. Remove the skin, cut off the bottom root area and slice the clove in half vertically, exposing the green sprout. 3. Remove the green sprout intact and slice the remaining garlic into 1/4 inch slices. 4. Place slices on a Teflex sheet and dehydrate at 105 degrees F until crisp. 5. Fill the bottom of a blender about 2 inches with dehydrated garlic slices. I used a VitaMix "dry" container but I believe any good blender will work. 6. Process in the blender until you have the desired consistency. If you want some "minced" garlic granules, stop before everything is processed into powder. 7. Sift the contents of the blender through a strainer. The sifted garlic can be used for garlic powder and what you catch in the strainer can be used as larger granulated or minced garlic. 8. To make garlic salt, mix the garlic powder with fine salt in a ratio of one part garlic to 4 parts salt. 9. Either continue this process until you've used all the dehydrated chips or store the remaining chips in a jar until you need them. The east coast is covered with snow and by the looks of my family's Facebook pages, my cousins and their children all seem to be staying at home enjoying a "snow day". My husband and I just got back from Minneapolis where it snowed the entire time we were visiting. Snow makes me want a hot, spicy bowl of chili so I thought I'd make that today while I was still day dreaming of beautiful snow flakes. With wheat being one of the most common foods in most of our households, it's ironic that wheat berries are so uncommon. Wheat berries are just unprocessed wheat from which all wheat products are made. A single wheat berry, or grain of wheat, is made up of the endosperm, the germ and the bran. The germ (containing the highest amounts of vitamins E and B complex) and the bran (containing most of the fiber) are removed when wheat is processed to make bleached, white flour. Over half of the wheat's important nutrients are lost during this process. Eating wheat berries in their natural, unprocessed form provides vitamin B1(thiamin), B2 (riboflavin), B3(niacin), B5 (pantothenic acid), B6, folic acid, vitamin E, manganese, iron, magnesium, phosphorus, zinc, copper, calcium and fiber. Whole grains, like wheat berries, lower the risk of type 2 diabetes, cardiovascular disease and other degenerative disorders. I love the nutty flavor of wheat berries. But most of all, I love their chewy texture. Although I've eaten various dishes with this delicious grain while dining out, I must confess I had never actually tried cooking them at home. A few weeks ago, while walking through the Marin farmers' market, I came across a vendor selling organic wheat berries. I quickly bought a bag and had been thinking about what to do with them ever since. I finally decided they would make a perfect ingredient for a big pot of vegetarian chili. Their chewy texture might simulate the texture of meat. The result came out exactly as I had hoped. My husband and I both thought the chili had the texture of ground meat but all the health advantages of a vegan chili. Most of the bad eating habits in this country are because we don't have the time to cook. The one downside of wheat berries is that they take some time to prepare. I soaked them overnight, rinsed them the next day and cooked them for 1 1/2 hours. The good news is that you can make a big pot of them and store them in the freezer for a month. So when you have time on the weekend, make a big pot of wheat berries, freeze them until you need them and use them in salads, pilafs, breakfast dishes, soups and in this tasty and healthful chili recipe! Although some recipes state that you don't have to soak the wheat berries, it's important to soak grains and legumes before cooking. Soaking neutralizes their phytic acid content which can bind (and make less available) important minerals like calcium, magnesium and zinc. The night before, soak the wheat berries in water. The next day, rinse well and cook in 2 1/2 cups of water with 1/2 teaspoon of salt. After bringing to a boil, lower the heat, cover and simmer for 1 1/2 hours or until they reach the desired texture. Drain and set aside. You can do this ahead of time and freeze the wheat berries until needed. Sauté the onion and pepper for 5 minutes, add garlic and cook an additional 2 minutes. Stir in half the cilantro, the chili powder and cumin. Add the tomatoes, black beans, pinto beans, corn, cooked wheat berries and vegetable broth. For additional "heat", add sliced jalapenos or chipotle in adobo sauce to taste. Bring to a boil, lower the heat and gently simmer uncovered for 30 minutes, stirring occasionally. Adjust salt if needed. If desired, add fresh black pepper to taste. Place in bowls, garnish with the rest of the fresh cilantro and diced avocado and serve. Per serving: 309.6 calories, 5.8 g fat, 0.8 g saturated fat, 0 mg cholesterol, 12.4 g protein, 54 g carbohydrates and 12 g of fiber. Vegan Mexican Chocolate Cake - Get Ready For Valentines Day! Bake in an 8 inch pan for 25 to 30 minutes. Carefully remove the wax paper from the bottom of the cake. Cool the cake on a rack with top side facing up. With less than 2 weeks until Valentines day, I started thinking about healthy chocolate desserts. Last year I posted one of my favorites - Raw Tropical Chocolate Truffles. Today I experimented with an old favorite, Vegan Mexican Chocolate Cake. What's fun about this recipe is that it mixes cinnamon and cayenne pepper with the chocolate and vanilla flavors for a very interesting taste. It rises beautifully without eggs or egg replacer from just the baking soda and the vinegar. To make it a bit more healthy, I use my favorite White Whole Wheat flour for extra fiber, I cut down on the amount of sugar and instead of making a high calorie icing, I just dust the cake with a bit of powdered sugar. It's quick and easy and delicious! Serve it with strawberries or raspberries and for an extra treat, top it with a small scoop of vanilla soy ice cream. Preheat oven to 350 degrees F. Cut wax paper to fit the bottom of an 8 inch pie pan and place in the bottom of the pan. Grease the sides of the pie pan with a vegan margarine or olive oil. Combine flour, Sucanat, cocoa powder, baking soda, cayenne pepper and cinnamon in a large bowl and mix well. Stir in the water, vanilla, vinegar and oil until combined. Pour mixture into the cake pan and bake for 25 to 30 minutes until you can insert a tooth pick in the middle and it comes out clean. Remove from oven and cool in the pan, on a rack, for 15 minutes. Turn the cake pan over on rack, remove the cake onto the rack and gently peel off the wax paper from the bottom of the cake. Turn the cake back over so it is cooling on the rack with the top facing up and cool another 15 minutes. Dust cake with powdered (confectioner's sugar), slice and serve with berries and/or soy ice cream. Per serving: 185.3 calories, 7.6 g fat, 1.3 g saturated fat, 1.3 mg cholesterol, 3.5 g protein, 26.5 g carbohydrates and 3 g of fiber.